The complete management solution for orthodontic treatments. Learn more about software for cephalometric analysis OrisCeph Rx CE. With OrisCeph Rx CE you can realize cephalometric tracings with more than 30 default techniques, in a quick and easy way. 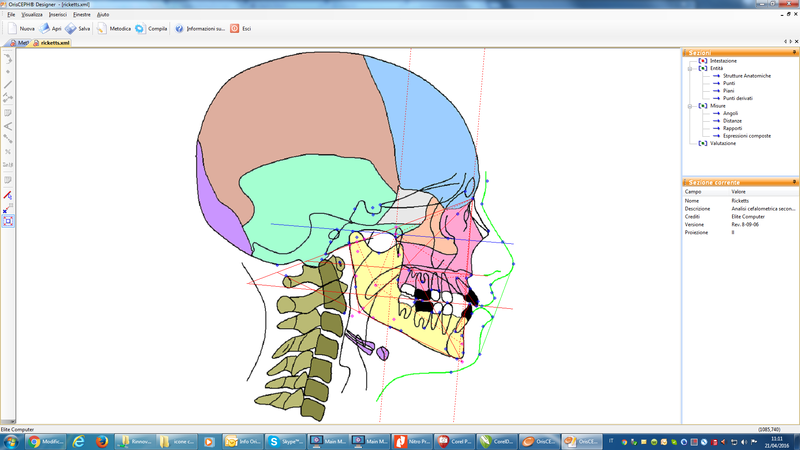 The programme can guide you for the insertion of cephalometric points and anatomical structures. You can display the diagnosis in real time, with parametric values and normogram. Different colours help you understand standard values and non-standard ones. OrisCeph Rx CE allows you to easily superimpose two or more tracings of the same technique, belonging to the same patient. You establish a common point and plan for the superimposition, or in free mode, and you drag and turn the tracings. Automatically OrisCeph Rx CE calculates the differences between the measures of the different tracings and displays the values in real time. OrisCeph Rx CE simulates the result of surgical operations and growth forecast. The Surgical VTO can be performed by altering the anatomical structure of the profile (soft tissue, skeletal muscle and teeth). By modifying growth parameters, the profile on the x-ray changes, as well as the calculation of values. Latero-laterals, axial, posterior-anterior, aesthetic techniques, Ricketts, Steiner, Tweed, McNamara, Jarabak, Cervera, Ricketts/Hasund, Standard, Bennet Mc Laughlin, Giannì, Giannì AP, Giannì 21F, E.B.O.-I.B.O., Cagliari and Genova School, Cervera and many others. Patient record and Clinical Diary. 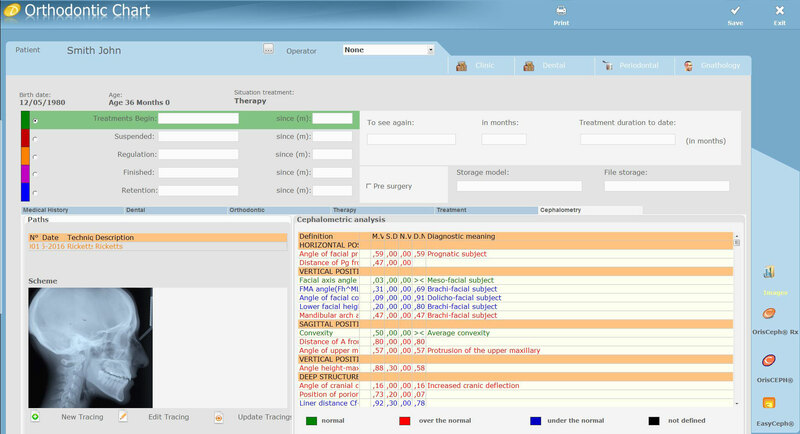 Manage in a quick and easy way all information related to the patient. The record and the clinical diary are linked directly to the images and the cephalometric tracings, for a better and complete view of all information. Display the normogram with values and measures according to the performed cephalometric tracing. 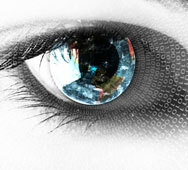 Different colours let you display the result in order to plan the treatment. 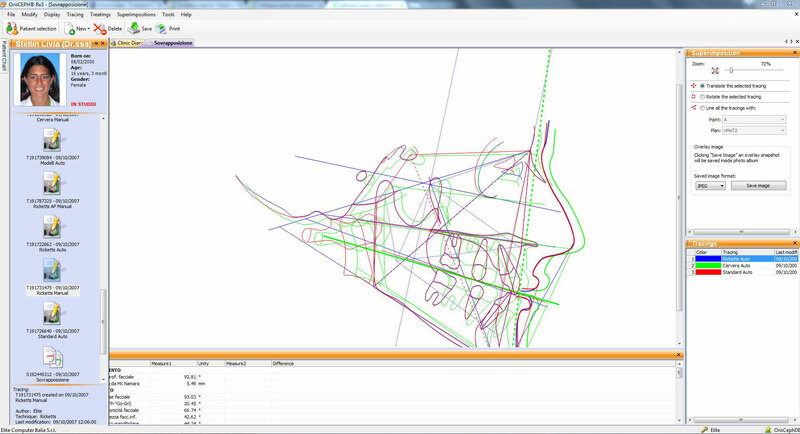 You can zoom, change colours and thickness of the lines, roto-translation and reshaping of the anatomical structures. You can also calculate plans, segments, angles and points, check brightness, contrast, negative, gamma correction, hue and saturation. 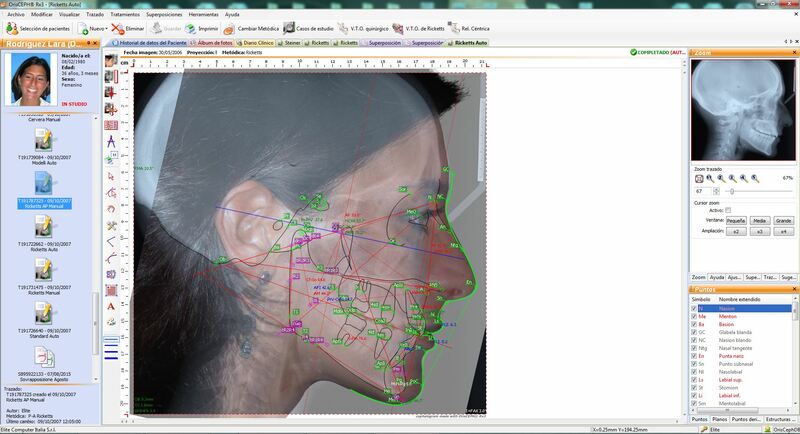 In Orisceph Rx CE you find an advanced tool that allows you to create your own customized techniques to perform cephalometric tracings. You can choose the landmarks, plans, angles, distance and values. You can create different techniques for each x-ray: latero-lateral, posterior-anterior, axial. OrisCeph Rx CE Designer is an educational tool used also in many Universities. 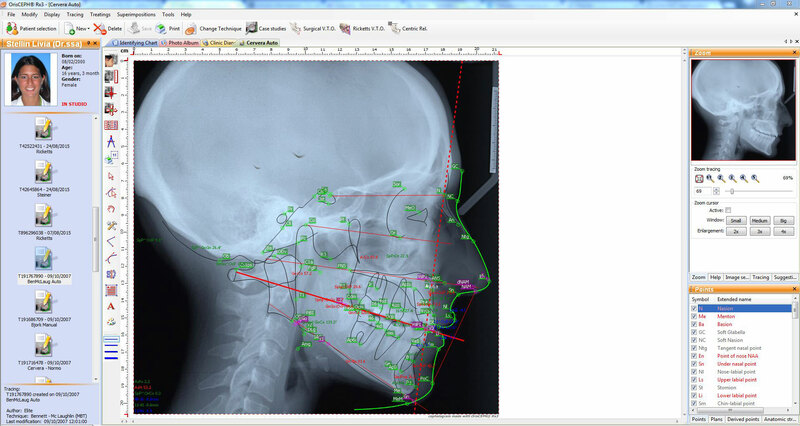 It allows you to display and identify on the x-ray the points and the plans of the different techniques and all information of values and measures on the cephalometric tracing. If you have OrisDent evo for the management of your Dental Practice you can automatically display the cephalometric tracing performed with OrisCeph Rx CE, directly in the patient record. You can launch OrisCeph Rx CE immediately from the patient record in OrisDent evo, without exiting the programme nor searching the name, for a quick and efficient management.